A fresh crunchiness to liven up your dishes. This no-grain granola recipe heaps together roasted seeds and nuts. A spoon of fennel and a few of maple syrup lends a light zest, rounding off the flavour. 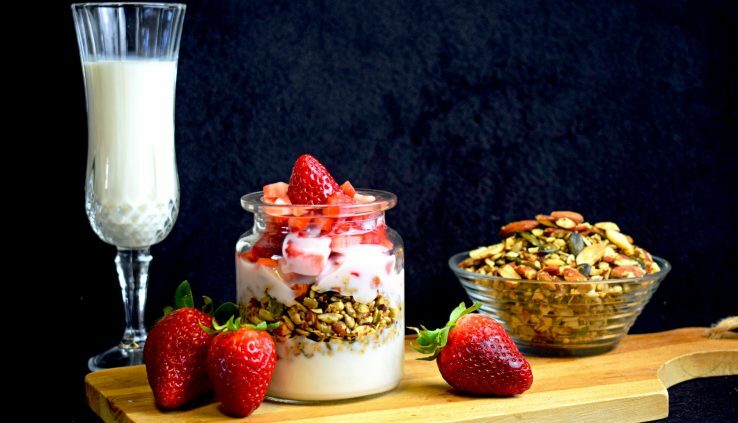 Add this granola to your yogurt breakfasts, desserts, or for a crunchy salad. 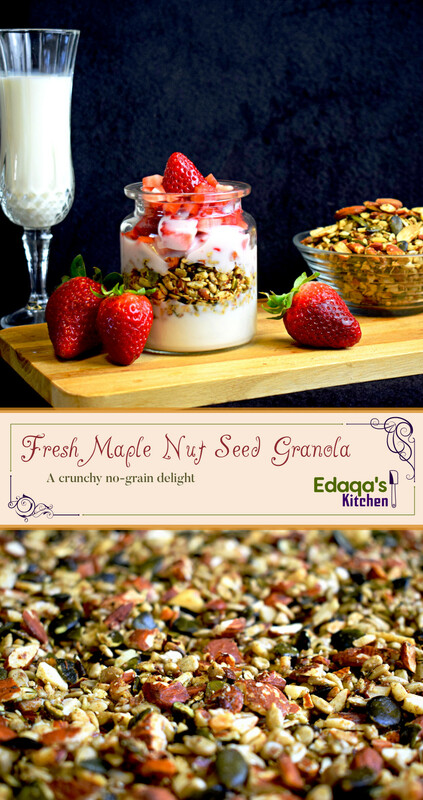 I wanted to make a variation of my crunchy nut seed granola that doesn’t use honey. I’m having some qualms about whether honey is ecologically friendly. As I push for sustainable food, it’s good to reach for alternative sugars. The maple syrup has a rich flavour, though I imagine any sugar would work. Yes, I know I’m not in favour of added sugar. I do most of my desserts without sugars now, relying on the natural sweetness of fruits. However, this granola doesn’t have any sweet ingredients. Adding raisins would weaken its crunchy angle. And I’m not totally against sugar, especially if used sparingly like in this recipe. You can leave it out if you want. It’s what I would do if I intended on adding it to a dessert with fruit. In the instructions, I say to chop the brazil nuts with a knife, instead of using a food processor, which I used for the other seeds and nuts. So far I’ve been unable to convince a machine to chop the brazil nuts nicely. I end up with some dust and large chunks — which creates an interesting flavour as well. If you have any luck getting your device to chop brazil nuts nicely, let me know. I’d love to see the result. I’ve chosen to melt the maple syrup as well as the coconut oil to ensure they mix well. Also, note the dry ingredients should be mixed before adding the wet ones. Otherwise, you might get some ingredients clumping together, producing a less uniform result. Roughly chop the almonds with a food processor. Add them to large mixing bowl. Roughly chop the pumpkin and sunflower seeds with a food processor. Add them to the large mixing bowl. Chop the brazil nuts with a knife. Add to the large mixing bowl. Add the ground fennel seed and salt, to the mixing bowl. Melt the coconut oil and maple syrup in a pot and add it to the mixing bowl. Mix thoroughly until all ingredients are coated. Break up clumps that form. Line a baking tray with backing paper. Dump the mixture from the bowl on the tray and spread evenly. Place in oven, on the middle rack, and bake for 10 minutes. Toss the mixture, either on the tray, or dump back into bowl and mix. Spread it evenly on tray again. Bake in the oven for another 10 minutes. If you wish to have a stronger roasted flavour, bake it on the top tray, but watch for excessive browning — a sign that it'll burn soon.